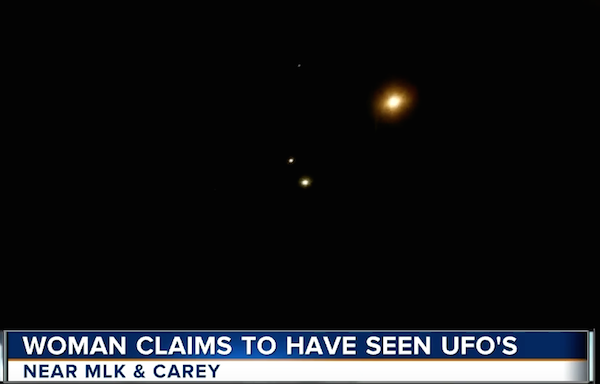 UFO SIGHTINGS DAILY: Las Vegas Woman Sees Tall White UFOs Leaving Nellis Air Force Base Often, Feb 2017, Video, UFO Sighting News. Las Vegas Woman Sees Tall White UFOs Leaving Nellis Air Force Base Often, Feb 2017, Video, UFO Sighting News. Las Vegas is near a lot of Extra Terrestrial action. Just on the outskirts of Las Vegas is Nellis Air Force Base, which has a Tall Whites Base near the old firing range area (all off limits fenced/guarded land). Its a huge base taking up 1,350 square miles! Enough for a small country. So why would the Air Force need such a large area of land? Because they gave some of it to aliens to build underground bases, but sometimes the are outside going for a walk, so the USAF gives them their own space so they don't accidentally encounter a person and kill them. Tall Whites like killing, its in their DNA, they are aggressive even with US solders. What this woman saw was Tall White ships coming and going from Nellis AFB. 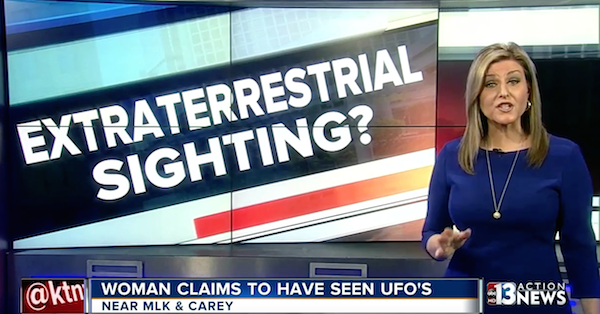 NORTH LAS VEGAS (KTNV) - A woman says she's seen the same strange light two times above her home near Martin Luther King Boulevard and Carey Avenue in North Las Vegas. She believes it's a UFO. Gwendolyn Mathews says it started Sunday around 7:30 p.m. She saw the same light not moving as she filmed it on Facebook Live for more than an hour. She says when she zoomed in with her binoculars, it appears to have legs coming out of it, similar to an octopus. She says the same light appeared again Tuesday night. "Whatever it is, it's beautiful, it's not a plane or a drone," Mathews says. We asked North Las Vegas airport and McCarran Airport about the UFO. They referred us to the FAA, who told us "we haven't had any unusual aircraft activity in the area. I'm not going to speculate about what that might be." Mathews still believes it could have been extraterrestrial visitors. "I know what I saw through those binoculars, I know what I felt," she says. After our initial story aired, a viewer who works at the weather station at the airport says it's the planet Venus. He says it appeared to "disappear" because it went behind a cloud, and says we had a broken layer of Cirrus cloud at 25,000 feet all night.